You can stop counting down the days: the new Rambo movie opens today! Are you as excited as Sly, pictured at left, is? At the film's premiere last night in Vegas, the looks were minimally camo. Hell, even Jenna Jameson looked classy. The surprisingly tasteful good, bad, and ugly, after the jump. 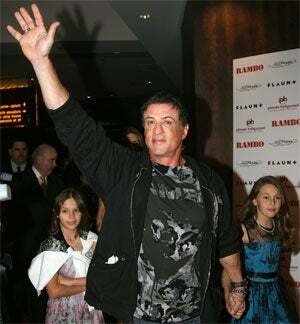 Jennifer Flavin Stallone and daughter Rose Scarlett both look pretty and pulled together. Julie Benz keeps it classy. Oddly enough, so does Jenna Jameson. But the best look of the evening has got to be Jenny Mollen in her adorable dress with her adorable date, Jason Biggs. The Governator looks overdressed compared to sons Patrick and Christopher. Christa Campbell looks a little trashy. Michael Godard. Yeah, that's all.